Adrian Doyle’s ‘Empty Nursery Blue’ project in Rutledge Lane combined the monochrome palette of Yves Klein with his powdery pigment laden monochrome blue and Christo’s sense of scale and landscape. Painting the whole lane blue from the tarmac to the buildings; this is going large on a scale never before seen in Melbourne. I agree with Hosier Lane Inc.; I haven’t seen much progress in street art this year until now. 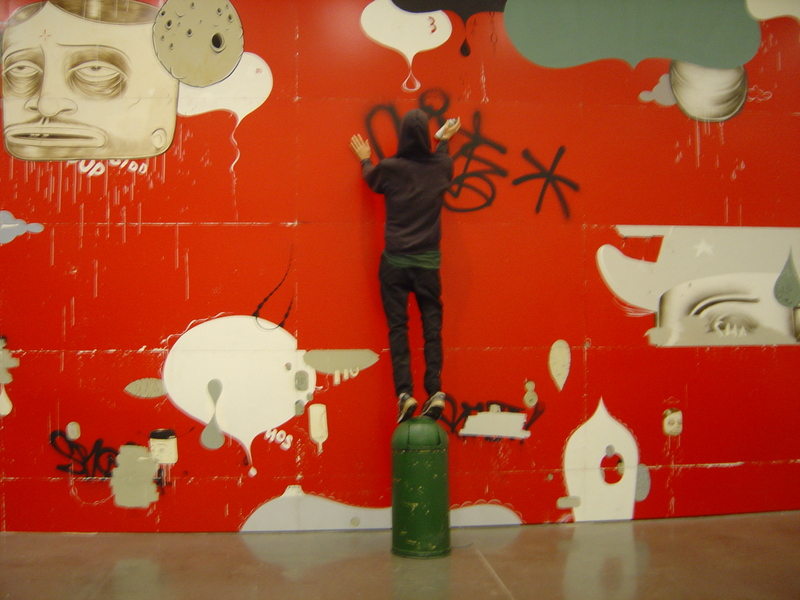 I applaud Doyle’s work as a challenge to the status quo and as a conceptual link between fine art and street art. This challenge to the status quo did not last long (only 45 minutes according to Doyle) after all Rutledge Lane is a free area for anyone to paint. The status quo responded by painting over ‘Empty Nursery Blue’ before the end of the day. I only “saw” ‘Empty Nursery Blue’ in a few photos on Facebook and it lasted only a few hours. So much for the street art ethos of don’t paint over it unless you can paint something better; in Invurt’s next post “Snapshots – Empty-Nursery Blue Burners @ Rutledge Lane” I didn’t see anything that even came close. Part of the audacity of Doyle’s project is being aware of all of this and what the reaction would be. “Today’s piece was not a buff, it was a burner!” Doyle commented on Facebook. The art of Keith Haring first came to my attention when he visited Melbourne (see my post Keith Haring in Melbourne). Haring was like a pop star, except that he was doing visual arts rather than music. I didn’t get to see him in Melbourne but he was everywhere for the next few years; I saw him on TV and in magazines and not just the art magazines. In the early 1980s Keith Haring along with other East Village artists, like Jenny Holzer and Barbara Kruger used ‘wall-posters’ (paste-ups/wheat-pasting). Haring’s paste-ups were fake news headlines like as: “REAGAN SLAIN BY HERO COP”; cutting up headlines was a strategy adopted from William Burroughs. 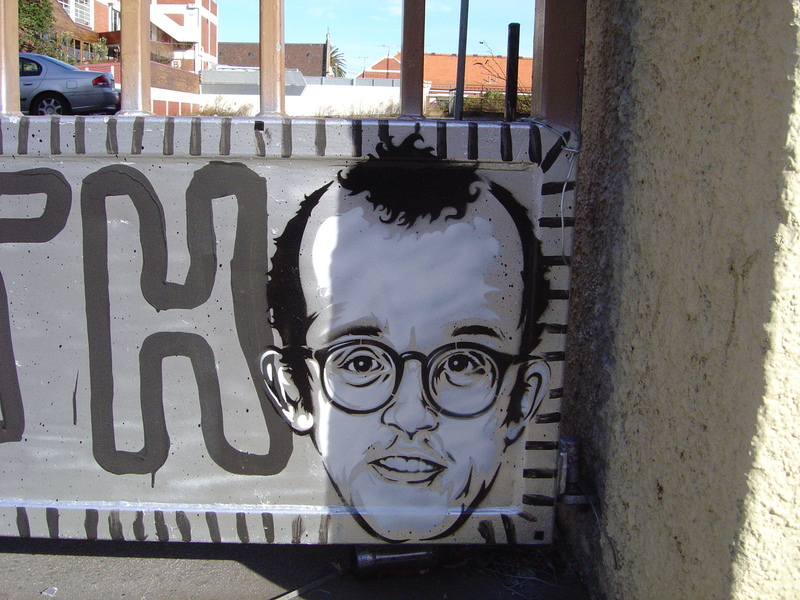 Haring also used stencils in his early street work stencilling “CLONES GO HOME” on sidewalk borders in the Village. This early flowering of what would later be known as street art heralds an art movement. “The galleries at that time were still dominated by people over thirty and mostly Conceptual and Post-Minimal art.” Keith Haring commented on his influences (Notes from the Pop Underground, Peter Belisto, p.99) Haring went the opposite direction, appealing to people under thirty, like me at the time, and creating art that didn’t depend on art galleries for their meaning. Haring’s line drawings worked on subway walls, t-shirts and even Grace Jones’ naked body. 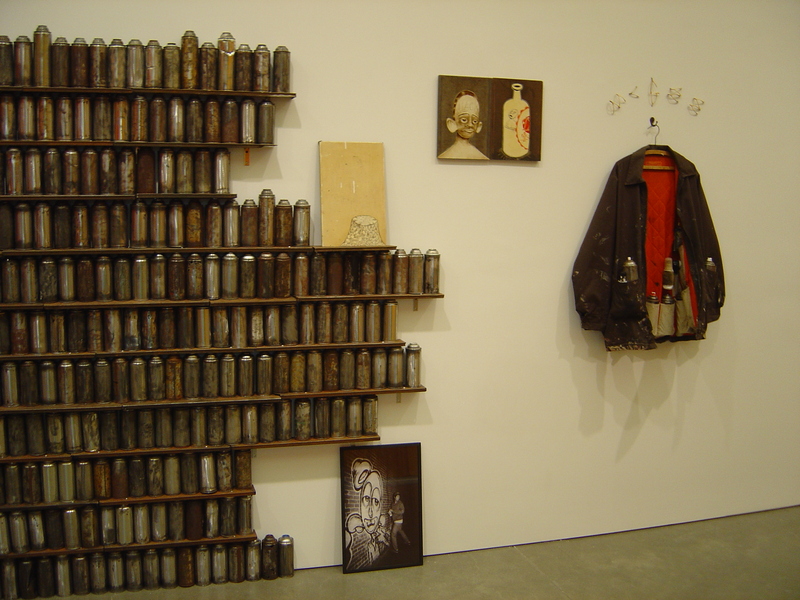 In 1986 Haring collaborated with Brion Gysin in “Fault Lines”; Haring’s art is connected to Gysin’s tagging calligraphy (see my post). 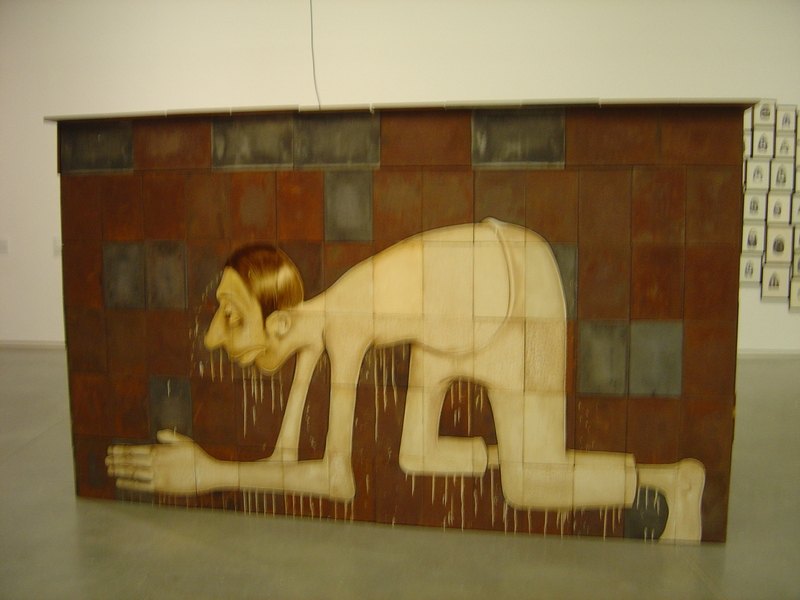 In 1988 Haring collaborates with Burroughs for “Apocalypse.” The great centipede with a television head in the Collingwood mural is an image clearly inspired by Burroughs who writes about giant aquatic centipedes in many of his novels. When Keith Haring died in February 1990, followed by the death of Jean-Michel Basquiat, it felt like the art of the 1980s had died. Both Haring and Basquiat were, what we would call today, street artists who had become international art superstars. Street art would have to wait another decade before its full flowering. After that I would look out for Haring’s wall every time I went that way in Collingwood. Now, finally after decades of inaction there preservation work has started on the site. It is a difficult issue, preservation or restoration, both will have loses – a restoration would lose the authenticity of Haring’s brushstrokes and preservation loses the vibrancy of the original but better either than the loss of the whole mural. Riding around Brunswick enjoying the sunshine and looking for interesting things to write about I couldn’t go past the Brunswick Pop Up Gallery. 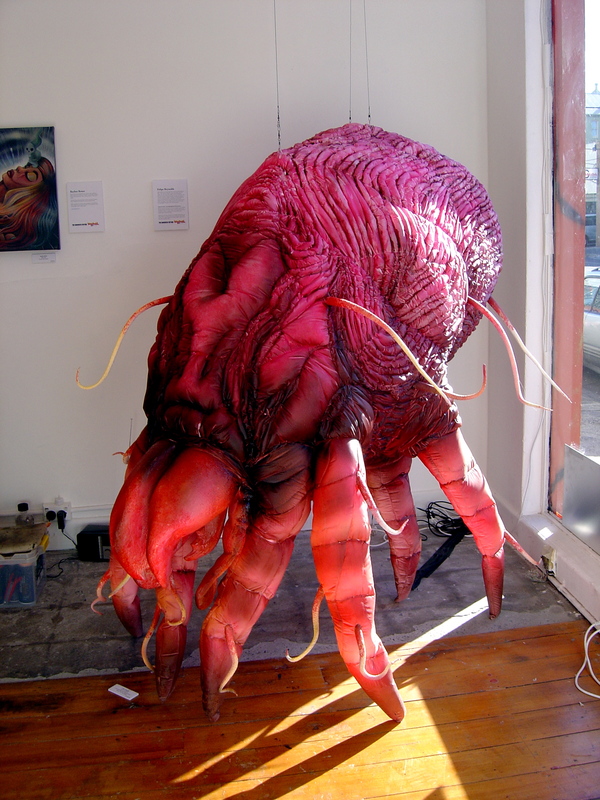 Especially after I looked in the window and saw a giant pink dust mite and some other puppets. 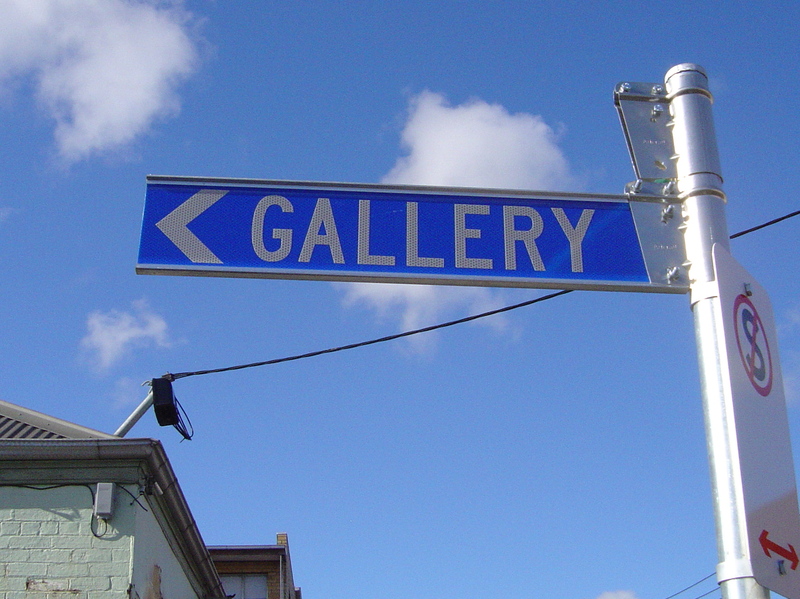 The curator, Joe Blanck was gallery sitting at the time. Joe told me about the dark exhibition opening where they had covered up the windows and visitors were given lanterns like the International Surrealist Exhibition of 1938. Joe is evidently a fan of Surrealism with a Dalian soft watch tattooed on his wrist. In the darkness of the opening he had moved his puppets around the crowd. There are 18 artists exhibiting in this exhibition and there is a lot of humor in the dark exhibition theme, like the puppet “Spanky, the manic teddy”. Some of the exhibition is in the realm of fantastic art; sculptures by Richard Mueck, brother of Ron Mueck, the paintings by Beau White and Isabel Peppard’s “Pupa” sculpture. Chip Wardale’s “ installation “7 music videos, 7 questions and self-reflections” was effective and lived up to its title. The outside of the installation didn’t contribute but it didn’t really matter once inside. Watching industrial music videos inside a mirrored cube was like being in your own small private world. Recently when discussing the architectural work of late 19th and 20th century sculptors I was asked if there were the same amount of work for sculptors today. Classical inspired architecture requires bas-relief and other sculptural ornaments. The Corinthian columns with their stylised Acanthus leaves on their ornate capitals all had to be designed and carved. Now with modern architecture eschewing ornamentation, where had all the work for sculptors gone? The Darkness Within provides ample clues to answer that question, there has been a growth of scenic artists for movies, theatre and advertising. Joe Blanck, for example, works at Creature Technology Company, the company behind recent arena spectaculars like Walking With Dinosaurs and How To Train Your Dragon.